Today I finally had some time to catch up on Fitness Magazine. While flipping through the pages of the March 2012 edition, I stumbled upon a mouthwatering photo for this recipe. I knew as soon as I saw it, I had to try it and I’m very happy with the end result and I thought I would share with those of you who take the time to check out my blog. 1. Cook shells according to package directions; rinse under cold water, drain and pat dry. 2. Meanwhile, heat oil in a large saucepan over medium heat. Add onion and chorizo and cook until browned, about 5 minutes. Drain all but 1.5 teaspoons of drippings and return pan to stove. Add tomatoes and sugar and season with salt and pepper to taste; simmer until sauce is slightly thickened, about 10 minutes. Set aside. 3. Preheat oven to 375 degrees and coat a baking dish with cooking spray. 4. Combine spinach, cheeses, egg white and 1/4 teaspoon salt and pepper in a large bowl. Spoon half the tomato sauce into the prepared dish. 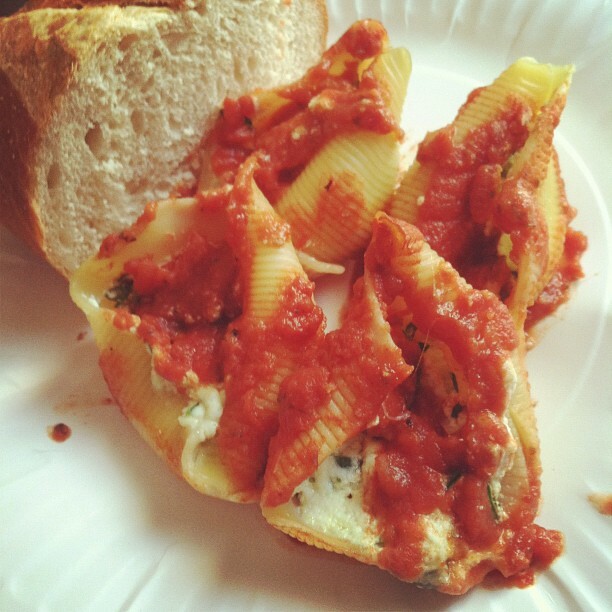 Stuff each shell with a heaping tablespoon of filling and arrange stuffed shells to fit in the baking dish. Spoon remaining sauce over the shells and cover with aluminum foil. Bake until pasta is cooked through and sauce begins to bubble, about 30 minutes. Let rest 5-10 minutes before serving.